These trips to the Greater Middle East for the date palms provide some of the first links between the two regions. The interactions these government scientists and local entrepreneurs had with the people of the Middle East are extraordinary and they speak not only to the complicated geopolitical realities of the area but also to American assumptions of racial and scientific superiority. 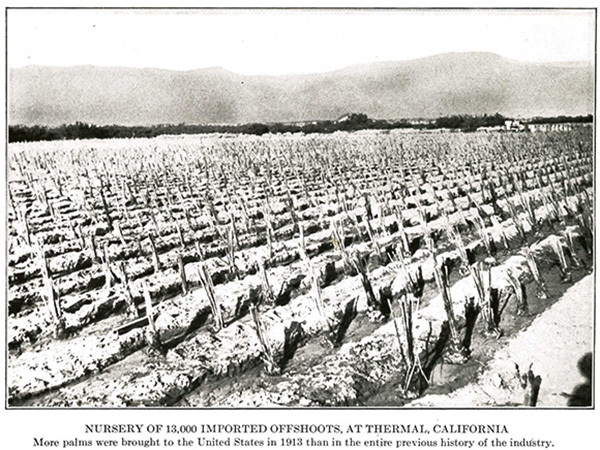 One Los Angeles Times article about the growing date industry, published in 1921, suggested that the "American scientific culture has far surpassed the Orient in date possibilities. In fact in the hot sand around Indio and Coachella the date has come to surpass anything of which the dozing Orient ever dreamed." Left: Mural from Coachella Valley High School | Photograph by Amanda McCormick; Center & Right: Images of Coachella Valley High School's mascots through the years with the current mascot in green. | Courtesy of the Coachella Valley Alumni Association. Learn more here.